Helen Tsanos Sheinman was raised in London by Cypriot parents, and grew up eating and cooking with a large and boisterous Cypriot family. Helen developed a passion for food early in life, and has found a way to reconnect with her Cypriot heritage through the traditional cuisine. For Helen, food is an opportunity to create wonderful new memories with family and friends. Love, Laughter, and Lunch will undoubtedly hold a special place in your hearts for years to come. The pieces offered combine traditional artistry with modern design elements, and bring a fresh translation of Cypriot culture and sensibilities to the global home market. Helen is also committed to volunteering her time in areas relating to human rights and education, and is an avid photographer. She studied philosophy, modern Greek literature, and linguistics at King’s College in London. She has also served as a diplomat at the Consul-General of the Republic of Cyprus to the United Nations. Helen and her family split their time between Manhattan, London, Greece, and Shelter Island, New York. She has two daughters with her husband Andrew Sheinman. Love, Laughter and Lunch shares the evocative memories of the Tsanos family journey recalled through traditional Greek Cypriot recipes. She invites readers to visit her childhood, growing up in London, and her adulthood spent in New York and on the Greek Island of Serifos, through over 25 mouth-watering, easy-to-make recipes that have been passed down by her family through generations. Featuring photography of Helen’s culinary creations and dazzling images of unique pottery and textiles made by contemporary Cypriot artisans, Love, Laughter, and Lunch will undoubtedly hold a special place in your hearts for years to come. The pieces offered combine traditional artistry with modern design elements, and bring a fresh translation of Cypriot culture and sensibilities to the global home market. flavor and tradition to the kitchen. 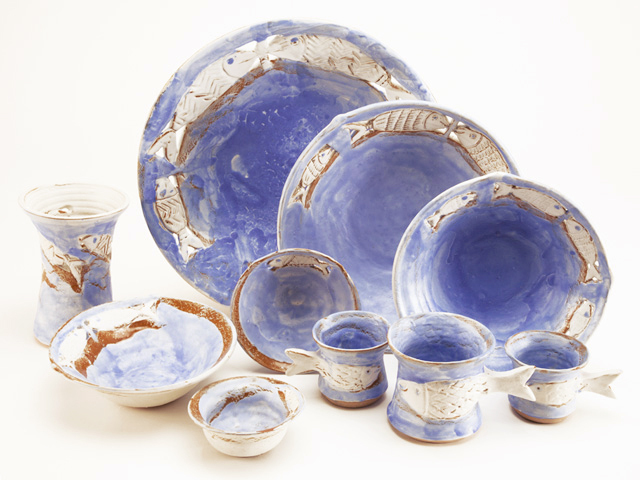 selection of ceramics, crafts, and textiles. My collection of products features selections from local markets, artist studios, and artisan workshops. All of the products are handcrafted, some are produced exclusively for us, but each one is original. My hope is to help not only the current artisans and artists of Cyprus continue their craft but also establish a new art school where the traditional handicrafts and techniques will be revived and enriched, allowing students to identify with their heritage and continue the creative process in a modern context. The beautiful artisanal products offered on our site are a small sampling of the myriad colors, textures and crafts produced in Cyprus. I am always sourcing artisans to enrich our collection of creative contemporary crafts made with traditional techniques. If you are interested in joining these artisans or would like more information about them or the mission, please contact me. 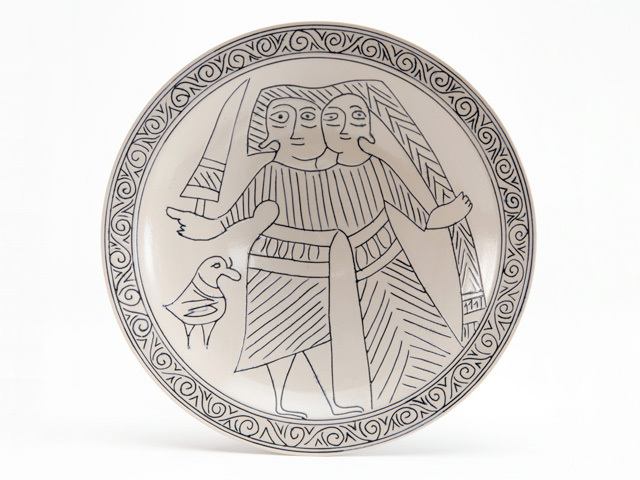 Surrounding a heart on the graphic rim of our Aedoni Plate are two lovebirds kissing in a blue sky. 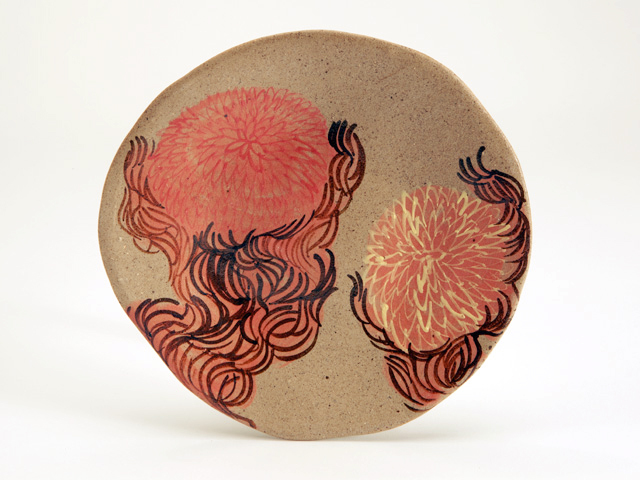 Hand-painted, handcrafted earthenware, dishwasher safe, washing by hand recommended. Dimensions are approximate. Delightful patterns of waves, fish and stripes embellish the Aegean Collection. Hand-painted, handcrafted stoneware, dishwasher safe, washing by hand recommended. Dimensions are approximate. 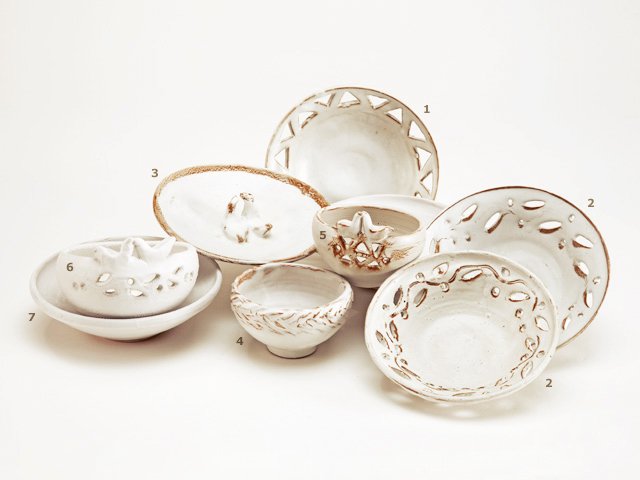 Distinctive for its two white doves and an eyelet lace pattern of olive branches or triangles, the Doves Collection is offered in white with earthtone accents or white wash. Hand-painted, handcrafted earthenware, dishwasher safe, washing by hand recommended. Dimensions are approximate. 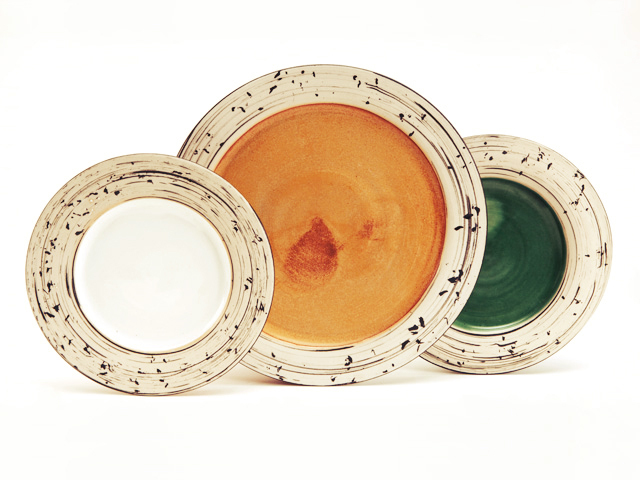 With a minimalist artistic border around these lovely plates and bowls, select between a sleek White center or the deep hues of Yellow, Beige and Green. Hand-painted, handcrafted stoneware, dishwasher safe, washing by hand recommended. Dimensions are approximate. The vibrant hues and expressive strokes in the nature-inspired designs of this collection are sure to speak to your heart. Hand-painted, handcrafted stoneware, dishwasher safe, washing by hand recommended. Plates vary in diameter from 7.5" to 9" at widest point of measure. 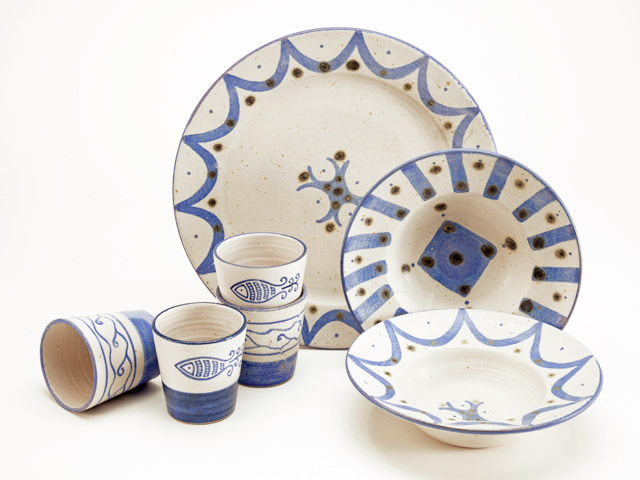 TIn classic hues of blue and white, our Psari Collection is handcrafted to touchingly depict kissing fish. The platters and larger bowls include the entire happy family. 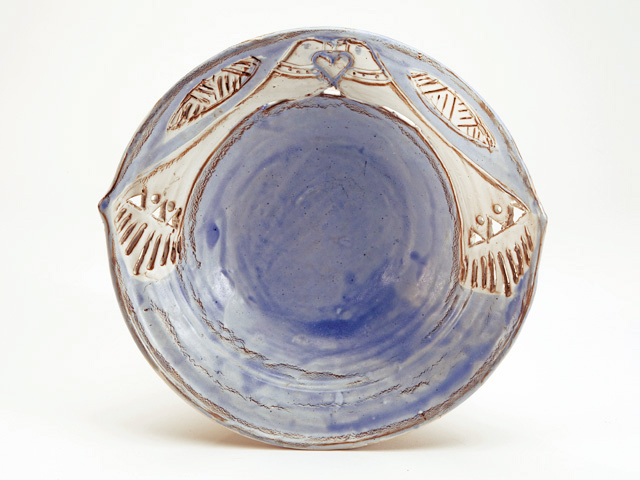 Hand-painted, handcrafted earthenware, dishwasher safe, washing by hand recommended. Dimensions are approximate. This assortment of colorful geometric plates is available in a myriad of hand-painted patterns composed of sea green, coral, white and black. 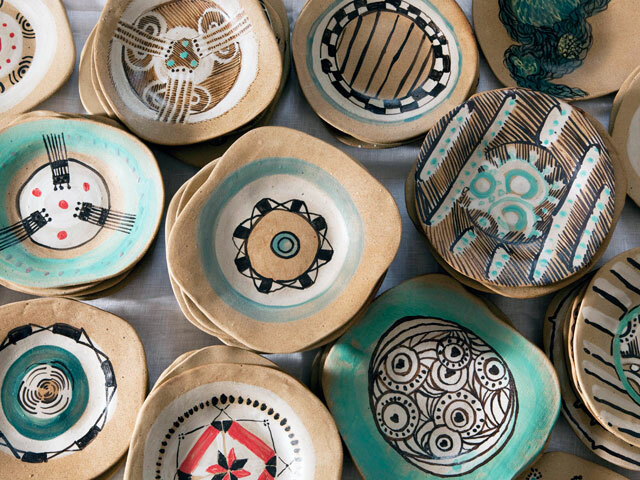 With the added charm of irregular shapes, these one-offs bring plenty of spirit to the table. Hand-painted handcrafted stoneware, dishwasher safe, washing by hand recommended. Plates vary in diameter from 7.5" to 9" at widest point of measure. 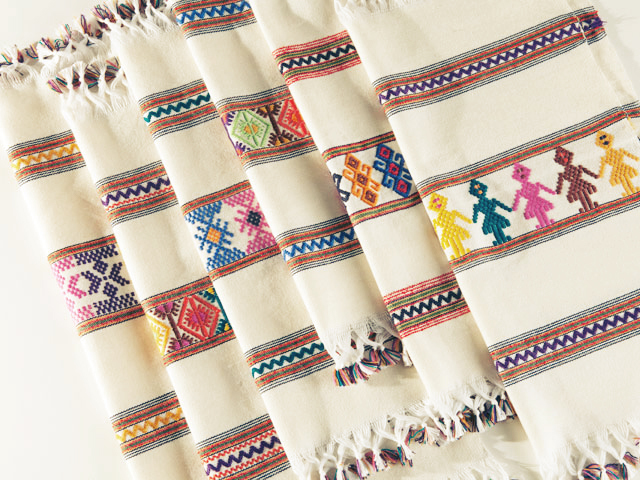 The embroidered patterns on our Fyti placemats are true to the colorful Cypriot traditions and lifestyle. Embroidered cotton weave handcrafted on traditional Cyprus loom. Dimensions are approximate. 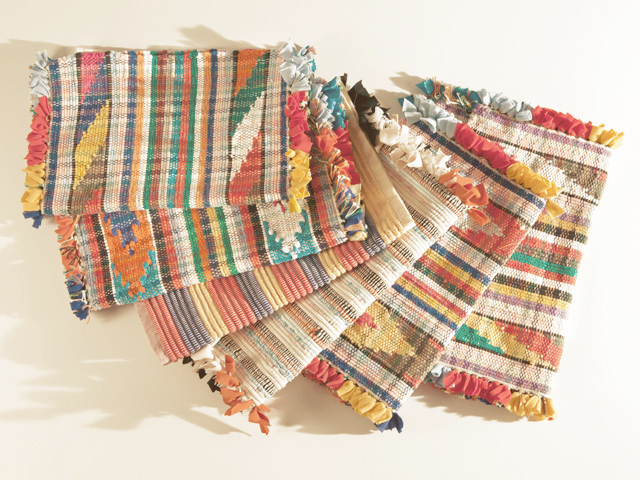 The multicolor Horio Placemats are available in an assortment of patterns, from stripes to plaids, and in primary or more muted tones. 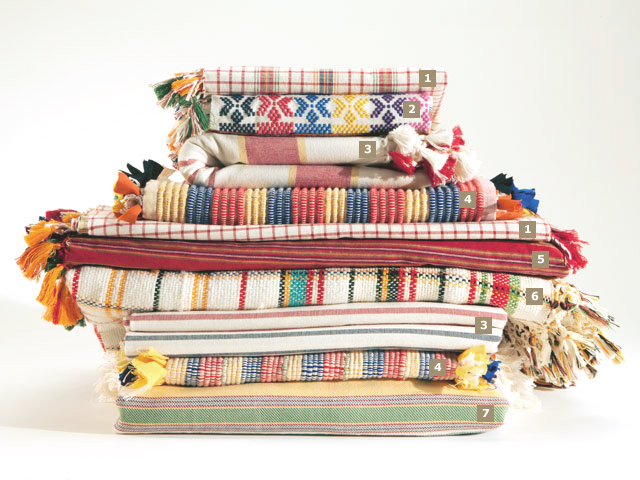 Woven in various materials on traditional Cyprus loom. Dimensions are approximate. The myriad designs of Kentima serve as eye candy in any combination. 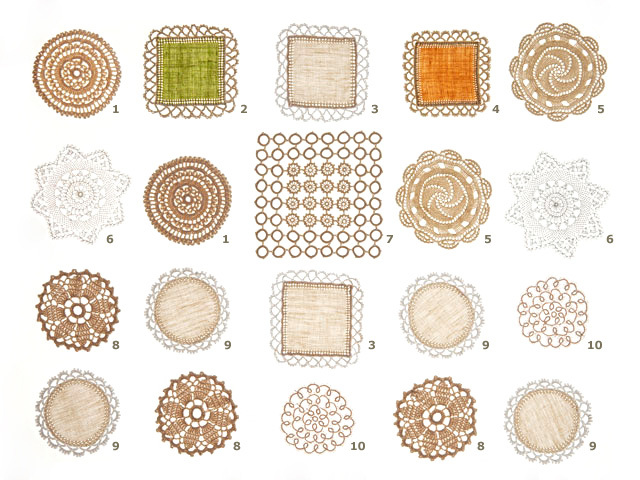 Shown as coasters, this collection may also be custom ordered as napkins, placemats, runners and tablecloths. Cotton or linen weave with crochet, lace, and other techniques. Dimensions available upon request. The Lefkara Collection of linen runners and placemats is available in a variety of delicately embroidered patterns or crochet inserts. Cotton embroidery or crochet inerts on 100% linen. Dimensions are approximate. 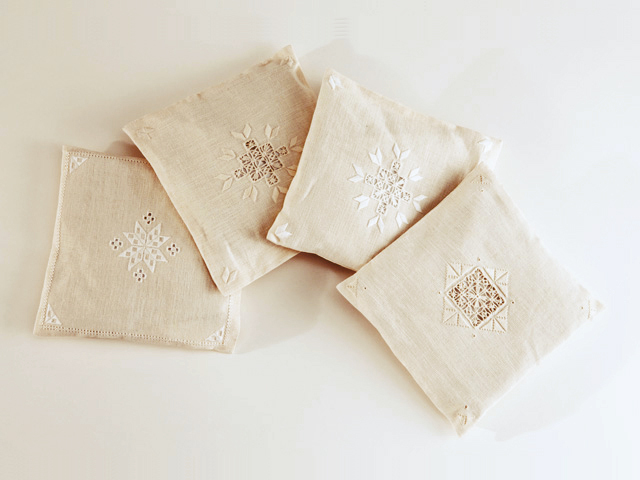 The Levanda Collection of sachet pouches and pillows are filled with the soothing fragrance of lavender, known for its aromatherapeutic benefits. Hang them in your powder room or let the scent of lavender set you adrift to sweet dreams. 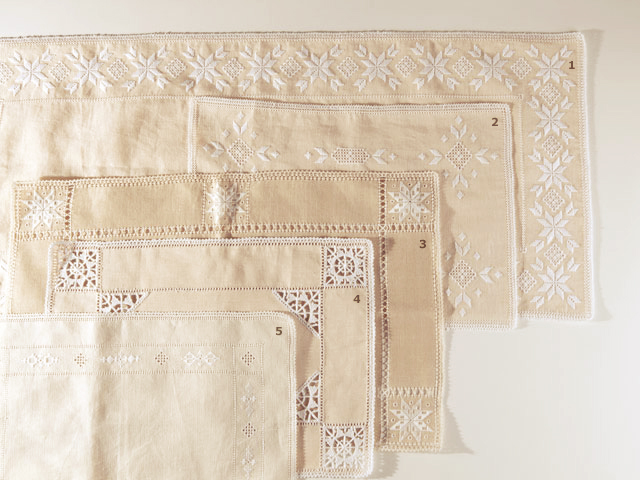 Embroidered linen filled with dried aromatic lavender from Cyprus. Dimensions are approximate. The bold stripes of Red or Blue on White of the Riges Tablecloth evoke the easy breeze of a sun-drenched Mediterranean day in the Greek Isles. 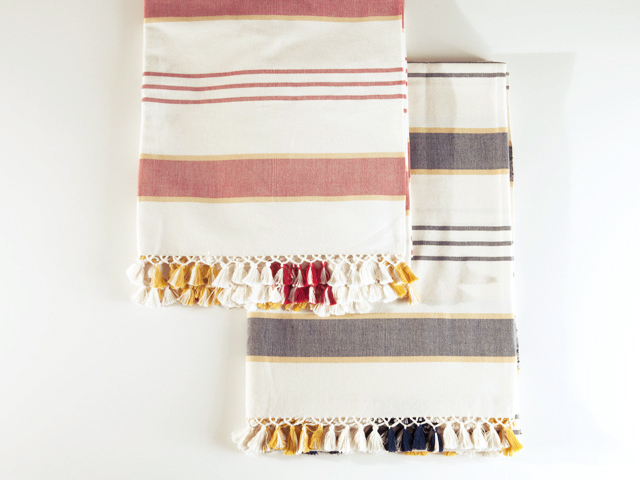 Striped cotton weave handcrafted on traditional Cyprus loom. Dimensions are approximate. 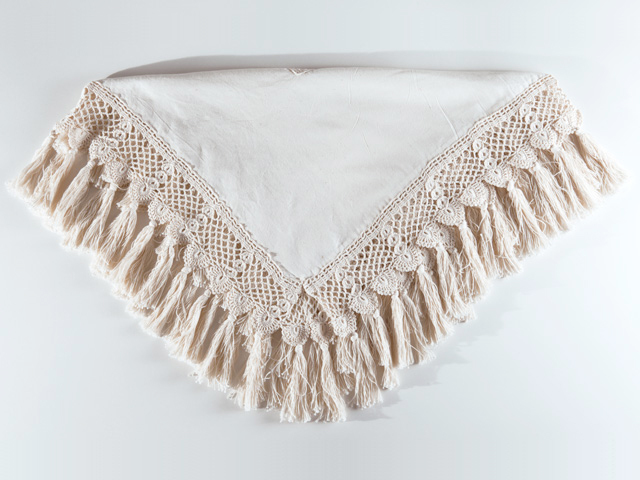 The decorative crochet detailing on our Smili Tablecloth is deceptively simple yet elegantly refined. Cotton crochet. Dimensions are approximate. 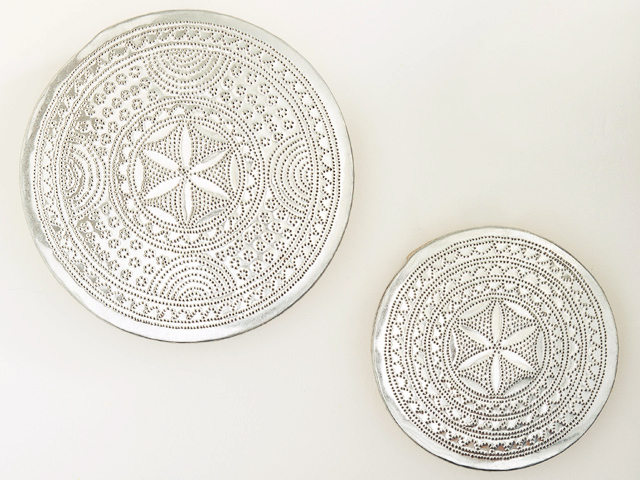 An intricate spiral pattern distinguishes the handcrafted silver filigree found in our Asimi Silver coffee spoons. 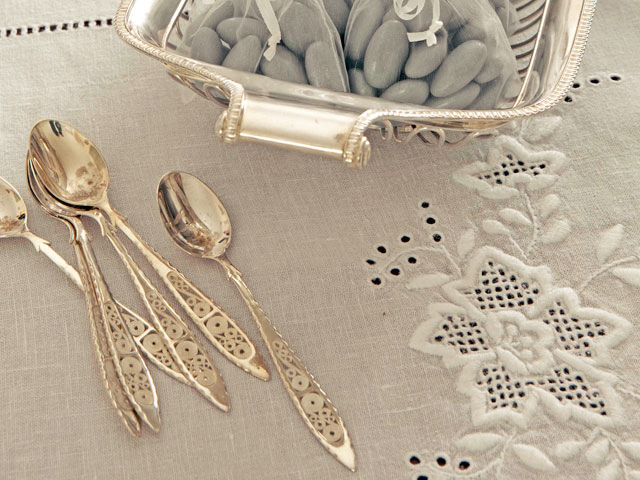 Coffee is integral to Cypriot lifestyle, but these silver spoons can be used for hot chocolate, tea, or whatever stirs your fancy. 830 purity silver filigree. Dimensions are approximate. The intricately patterned sieves of the Metallo Collection are perforated by hand in the ancient metalworking technique called punching. Hand-punched tin and wood. Dimensions are approximate. 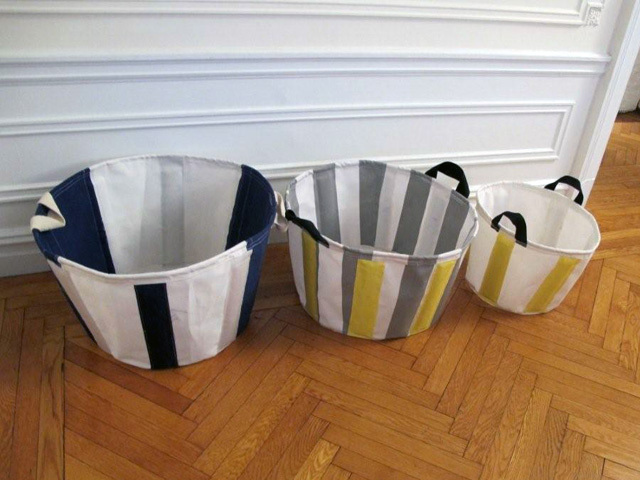 The Tsanta Tote Bags are artfully constructed with strips of repurposed canvas into a functional all-purpose tote inspired by bags used by Greek fisherman for carrying and stowing nets aboard their boats. Canvas and other materials. Dimensions are approximate. 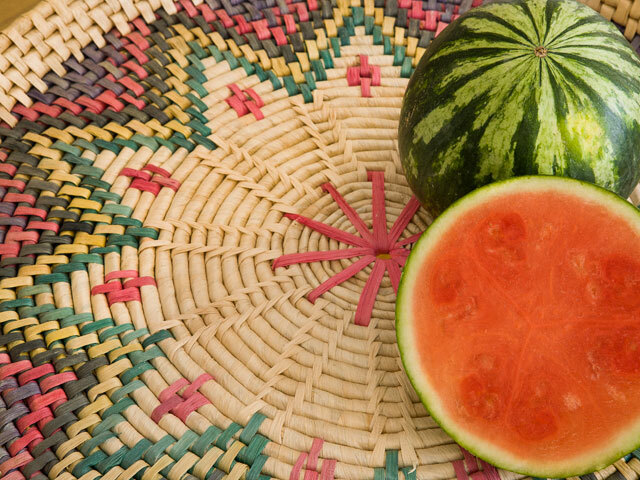 The natural rattan of the Tsetsos Tray is handcrafted from cane harvested along rivers and lakes in Cyprus then hand-dyed, to create a starburst basket weave perfect for serving seasonal fruit and dry goods. Hand-dyed hand-woven rattan. Dimensions are approximate.